This just in from the Wall St. Journal: good bartenders don't rely on computers. Eric Felton's snarky piece reviewing a bunch of the Grande Dame hotel bars makes for an interesting read. I'm sure many of us could recount similar disappointments, but I wouldn't expect someone to necessarily know what an Americano Highball is, either. Gus would know... Meet Gus. The best hotel bartender I encountered in my travels didn't need any new training program to teach him how to make great cocktails. 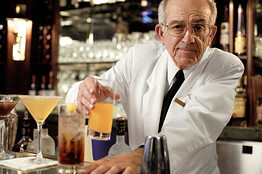 Gus Tassopulos, dean of the barmen at L.A.'s Hotel Bel-Air, has been mixing drinks for five decades. He started at the Beverly Hills Hotel in 1959 and came to the Bel-Air in 1990. Mine wasn't the first request for an Americano, which he mixed right up. His Sidecar was a thing of beauty, made with fresh lime juice, and every ingredient carefully measured to make sure the drink would have the correct balance. Mr. Tassopulos was also a paradigm of dignified, old-school service -- friendly but formal, attentive without being intrusive. I couldn't believe my eyes! Reading this article about bartending skills in old hotel bars, which is a topic near and dear to my heart. And look who it is. Gus! Gus and my experience drinking at his bar, the Bel-Air, is always the model against which I compare all other bartenders. I mean, before martinis made their comeback (followed by their nosedive into dessert drinks) I used to say "if the bartender doesn't have gray hair, don't bother." Back in those days, it was true. Thankfully, not so much anymore, but there was that time in between when only a guy that looked like Gus would do. Let me tell you my Gus story. Any barfly in the know (or with glamourous friends that are and who generously schlepp you along for the evening...) knows Gus. But he'll never tell. You see that's one of the requisite qualities of a good bartender: discretion. One does not want to have your freqency noted to your current companion. If you do, you're a poseur. Nor do we care to hear about the famous clientele who are in the room tonight or were. Another quality? Graciousness. I'm not just talking about the way that Gus removed the nuts Catherine didn't favor from our mixed nut bowl (which I swear to you, he did). It's doing it in a way that doesn't call attention to the extra care. How did he know? It wasn't that some kid put a note in the computer, it wasn't that she told him. He noticed which she left in the bowl. He removed them and made sure no more were taking the space preferred nuts might take. Talk about service. Of course the baseline is that they can make a good cocktail. Sadly, this is apparently in short supply according to Eric Felton's excellent piece, Grand Old Hotels Take the Bar Exam, here. Happily, Boston is enjoying something of a cocktail renaissance. Bartenders everywhere are building their repertoire of classic cocktails, or they're creating their own. In some cases, they're even making their own bitters, herbal infusions and such. The wonderful Lauren Clark of DrinkBoston recently shared her view of 10 bars for the over 35 imbiber. Start there and work your way over to her blog. Why not resolve to try one of the bars on her "Best Boston Bars" list each month? I'd have to say I haven't found my Gus here yet, but at least we've got some viable options now.